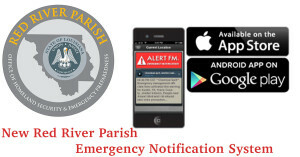 Red River Parish, LA, September 3, 2015– Red River Parish Office of Homeland Security & Emergency Preparedness and Red River Parish Police Jury has implemented an Emergency Notification System that will allow you to receive emergency notifications to your Apple or Android Device by downloading the Alert FM App then putting in your Zip code 71019. If you do not have Apple or Android device an Alert FM Receiver can be purchased from Alert FM on their web site www.alertfm.com for $45.00. Alert FM is a personal alert and messaging system that enables officials to create and send targeted information, including NWS severe weather warnings, evacuation instructions, school closings, homeland security notices, and Amber Alerts to first responders, school officials, businesses, and citizens. Alert FM service has been provided free of charge from the Governor’s Office of Homeland Security & Emergency Preparedness for the next eight years. This alert and messaging system is capable of sending mass or targeted FM-based messages to ALERT FM receivers or cell phones equipped with radio chip and software. The system will also allow messages to be received via email, cell phone (SMS text messaging and Smartphone application), and other consumer devices- truly making ALERT FM accessible to every household in the area. If you would like more information about this topic, please contact Shane Hubbard at (318) 932-8506 or email at Redriver.ohsep@gmail.com.